The basic idea behind an object-oriented programming (OOP) is to combine both data and associated procedures (known as methods) into a single unit which operate on the data. Such a unit is called an object. Python is an object-oriented language, everything in Python is an object. We have already worked with some objects in Python, (See Python data type chapter) for example strings, lists are objects defined by the string and list classes which are available by default into Python. Let's declare two objects a string and a list and test their type with type() function. As string1 is an object, strings "Good Morning" can produce an uppercase or lowercase version of themselves calling upper() and lower() methods associated with the string. Check it in the Python IDLE. Before introducing classes we must discuss something about local variables, global statement, and a nonlocal statement as well as Namespaces and scope rules. When a variable is declared inside a function, that variable is accessible only from that function or statements block where it is declared. The variable has no relation with any other variable with the same name declared outside the function, therefore the variable is local to the function. See the following example. Line No.- 4 : Assign the value 50 to 'a'. Line No.- 5 : Again print 'a', as a is local within the function, therefore, the value of a is now 50. Line No.- 8 : This is the last print statement and 'a' becomes 100. So far what we have done within the function which has no effect on the function. This is called the scope of the variable. The purpose of the global statement is to assign a value to a variable which is declared outside the function. Free variables (See Line No. 06 in the previous example) may refer to global without declaring global. The syntax of global statement is -> global var_name1, var_name2, ..
Line No.- 3 : The variable 'a' is declared as a global variable, therefore the value of a is now 100. Line No.- 5 : Assign the value 50 to 'a' and it will hold same value inside and outside the function unless we assign a new value. The nonlocal statement is used to rebind variables found outside of the innermost scope. See the following example without a nonlocal statement. The second print() statement prints the value 'a', which is 20 as the variable 'a' is rebound.. In general, a namespace is a naming system to create unique names. In daily experience, we see railway stations, airports, the capital of various states, the directory structure of filesystems have unique names. As of other programming language Python uses namespaces for identifiers. A namespace is a mapping from names to objects. - For example 'a' maps to [1, 2, 3] or 'a' maps to the value 25. - Most namespaces currently implemented as Python dictionaries (containing the names and values of the objects). - Names in different namespaces have absolutely no relationship (e.g. the variable 'a' can be bound to different objects in different namespaces). - Examples of the namespace : The global name of a module, local names in a function invocation, built-in names (containing functions such as min()), attributes of an object. Python creates namespaces at different times. 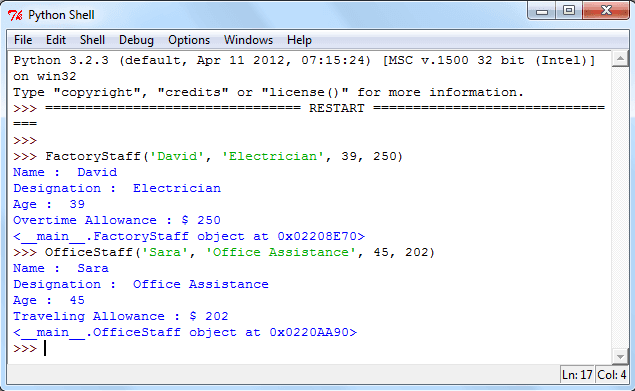 - The built-in namespace is created when Python interpreter starts and is never deleted. - The global namespace for a module is created when the module is called and last until the interpreter quits. - The local namespace for a function is created when the function is called and deleted when the function returns. - The local scope, searched first, contains the local name. - Enclosing scope (in an enclosing function) contains non-local and non-global names. - The current module's global names. - The outermost scope is the namespace containing built-in names. In object oriented programming classes and objects are the main features. A class creates a new data type and objects are instances of a class which follows the definition given inside the class. Here is a simple form of class definition. A class definition started with the keyword 'class' followed by the name of the class and a colon. The statements within a class definition may be function definitions, data members or other statements. When a class definition is entered, a new namespace is created, and used as the local scope. Here we create a simple class using class keyword followed by the class name (Student) which follows an indented block of segments (student class, roll no., name). then Student.stu_class, Student.stu_roll_no, Student.stu_name are valid attribute reference and returns 'V', 12, 'David'. Student.messg returns a function object. In Python self is a name for the first argument of a method which is different from ordinary function. Rather than passing the object as a parameter in a method the word self refers to the object itself. For example if a method is defined as avg(self, x, y, z), it should be called as a.avg(x, y, z). See the output of the attributes in Python Shell. __doc__ is also a valid attribute which returns the docstring of the class. The concept of inheritance provides an important feature to the object-oriented programming is reuse of code. Inheritance is the process of creating a new class (derived class) to be based on an existing (base class) one where the new class inherits all the attributes and methods of the existing class. Following diagram shows the inheritance of a derived class from the parent (base) class. In a company Factory, staff and Office staff have certain common properties - all have a name, designation, age etc. Thus they can be grouped under a class called CompanyMember. Apart from sharing those common features, each subclass has its own characteristic - FactoryStaff gets overtime allowance while OfficeStaff gets traveling allowance for an office job. The derived classes ( FactoryStaff & OfficeStaff) has its own characteristic and, in addition, they inherit the properties of the base class (CompanyMember). See the example code. 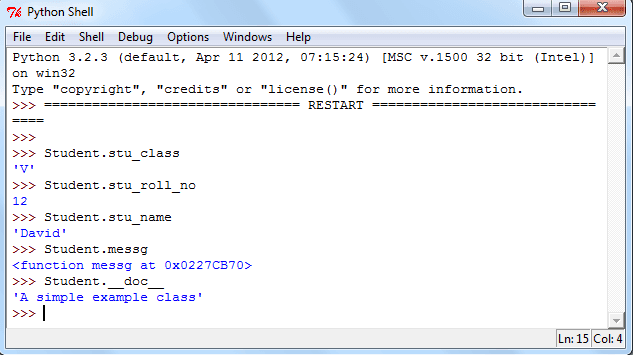 Now execute the class in Python Shell and see the output.